Social media and digital tools are great for both finding and sharing images online. Online photo sharing sites have numerous advantages over keeping photos on your hard drive (although they are not without disadvantages and shouldn’t be considered foolproof storage). They make it easy to share pictures and give you additional features for organization such as tags and search. This has benefits for both the photo owner and those of us who want to view or use images. Access controls let you control who can see or download which photos, and licence controls let the owner feel more secure about sharing images while users can feel comfortable downloading them. Go to Flickr. Take the Flickr tour if you want to find out more about it. Use the search box or the explore option to find an image that you’d like to blog about. Experiment with different search terms, and see how they change what results you get. Note the features of a Flickr image. On the right-hand side you’ll see the name of the photo and the username of the photo’s owner. Sometimes the owner will have added additional information such as date or type of camera/lens. If the photo is in any groups or sets, they’ll be displayed on the right side too. Below this, you’ll find the photo’s tags. Depending on the photo settings, these may have been added by the photo owner or by other Flickr. Finally, you’ll see information about usage and licensing as well as privacy settings. You can download or share the image via the tabs at the top left. If you’re on Flickr, you may want to consider joining a group. Try searching groups for keywords in your area of research, or your other interests. 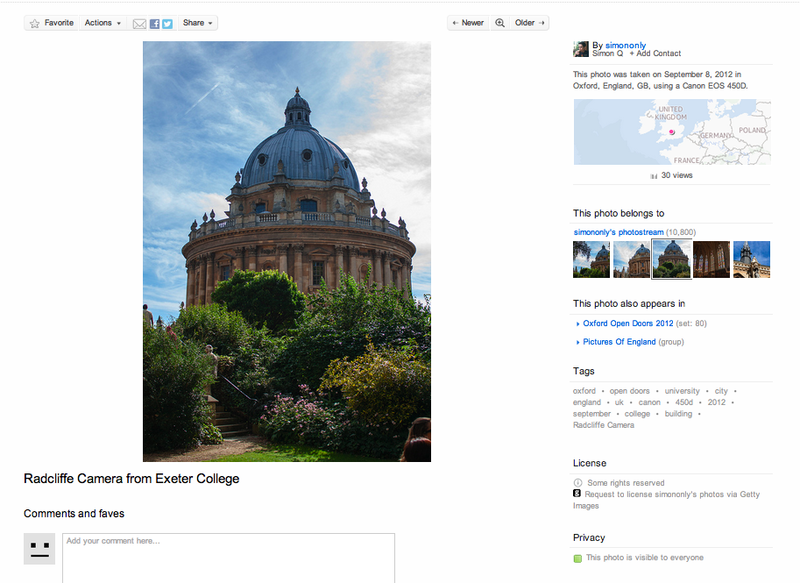 This entry was posted in Thing 17 and tagged Flickr, Images by Alasdair Watson. Bookmark the permalink.